Ruark Audio MR1 Mk2 review | What Hi-Fi? We loved the first Ruark Audio MR1 desktop speakers when they emerged in 2013. The retro looks, the intuitive design, the superb wireless sound – it was a winning combination that earned two successive What Hi-Fi? Awards. But the MR1s were toppled from their perch by the KEF Eggs, which have won the two subsequent Best Desktop Speaker Awards. So it was only a matter of time before Ruark Audio unveiled MR1 Mk2. And sure enough, Ruark Audio is back with a vengeance. Gorgeous looks, streamlined design and features, sound quality that’s been improved in every way – the Ruark MR1 Mk2s shoot straight to the top of our favourites list. We said the original Ruark MR1s were the closest any desktop wireless speaker had come to sounding like proper hi-fi, and that’s equally true of the new Mk2 version. In fact, it’s even more so now, thanks to a clearer, more insightful and open sound than their predecessors. The new MR1s are wonderfully musical. The amount of subtlety conveyed is even greater than before, delivering rich detail and fluid dynamics on a whole new level. There’s plenty of space between instruments in the airy soundstage, giving songs an expansive feel that makes the KEF Eggs sound rather congested in comparison. The Ruarks breathe new life into whatever music you play through them. The dominant bassline in SBTRKT’s Wildfire is taut, packs a punch and you can hear its deep, squelchy textures. The MR1s are agile and authoritative. They time well, too; the magnificent pomp of David Bowie’s Magic Dance blares through the speakers with plenty of energy and sparkle. Voices in particular sound lovely. Bella Hardy’s The Driving of the Deer is delivered with the kind of effortless drive and insight we’d expect from decent hi-fi speakers. There’s a solidity underpinning the rich, warm midrange, and the elegance with which her lilting, nimble vocals are delivered is simply gorgeous. The Mk2s sound lush and smooth while also being articulate. They convey the mood of songs faithfully, too – an impressive feat for wireless speakers. Elliott Smith’s soft, whispered singing on Angeles will pull at your heartstrings, every nuance of his voice and the tactility of his guitar strumming laid bare through. 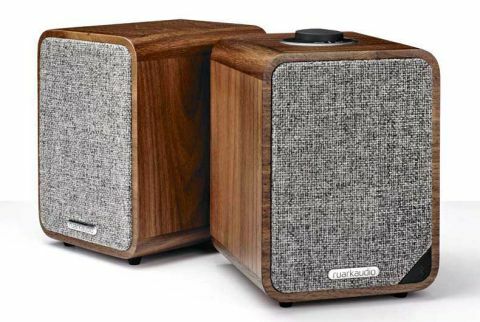 The Ruark MR1 Mk2s are lovely to listen to, but their stylish retro looks are a huge part of the charm too. The handcrafted wooden cabinets are beautifully made, the speakers are good to use, and they’re just the size to fit onto a bookshelf, TV stand or desk. Ruark has been wise to keep its characteristic look, but it doesn’t rest on its laurels. Where possible, the design has been streamlined. The most obvious update is the grey fabric covering the grilles – both for aesthetic and acoustic reasons. The cable connecting the left and right speakers is now slimmer and covered in braided fabric. Less obvious, but far more useful, is the addition of an optical input that can support hi-res audio up to 24-bit/192kHz - a big update, and one that surpasses the KEF Eggs' 24-bit/96kHz limit. It also means you can use the new MR1s as TV speakers. The optical input joins a 3.5mm auxiliary input and a subwoofer output at the back of the main unit (ie. the right speaker, which houses all amplification and connections). Ruark continues to apply hi-fi speaker principles with the MkIIs. From tuned crossovers to the use of A/B amplification – everything is aimed at delivering the best possible sound quality. The cabinets (in rich walnut or a new soft grey finish) each house a 20mm tweeter and 75mm mid/bass, with small bass ports underneath each unit. The rotary dial that sits on top of the main unit has been further refined. It’s nicer to use, turns smoothly and allows you to switch between inputs. You no longer have to press down and hold to activate the Bluetooth pairing mode, either. The MR1s automatically start searching for a Bluetooth connection when switched to that source, so they're quicker to play your music. These little things make all the difference. Even the LEDs for each source (blue for Bluetooth, orange for aux, green for optical) have been subdued so they’re not too piercing in darkened rooms. While you’re most probably going to be controlling playback and volume through your smartphone or laptop (or TV remote), you do get a tiny, slim remote in the box with basic functions like switching inputs. We wish this were classier in feel. Other features include a smarter auto standby mode, an optional battery pack to make the MR1s portable, and the ability to use the main right speaker as a single mono speaker. It's a well catered features list, although we wouldn't mind seeing a USB input in a future version. But any minor issues are overshadowed by the design and performance of these excellent speakers. The step up in performance in impressive, and the Ruark MR1 Mk2s manage to be even more appealing than before. Quite simply, these are superb speakers of their type.